Austin is known for its great outdoors, both within the city limits and in the nearby rural Texas Hill Country. Get out and explore everything from winding hiking and biking trails to cool swimming holes and lakes perfect for paddling. Courtesy of McKinney Falls State Park. Hike along the leafy 10-mile Ann and Roy Butler Hike-and-Bike Trail at Lady Bird Lake, which skirts along shimmering waters and has picturesque views of Austin’s skyline. Snap a selfie with the memorial statue of Austin music legend Stevie Ray Vaughan, stationed along the route at Auditorium Shores. Just 30 miles west of Austin, hike through a Texas Hill Country landscape of limestone cliffs and stone river beds along the Pedernales River at Pedernales Falls State Park. Follow Juniper Ridge Trail, which wends through a shaded mesquite forest and leads to the park’s rushing Pedernales Falls. Biking on the Butler Hike & Bike Trail. Credit Nick Simonite. The Violet Crown Trail offers great in-town mountain biking, with rocky surfaces and steep slopes. The Barton Creek Greenbelt is also a great destination for mountain bikers (enter at the Loop 360 access point), offering varied terrain within a beautiful landscape of cliffs and shaded groves alongside scenic Barton Creek. 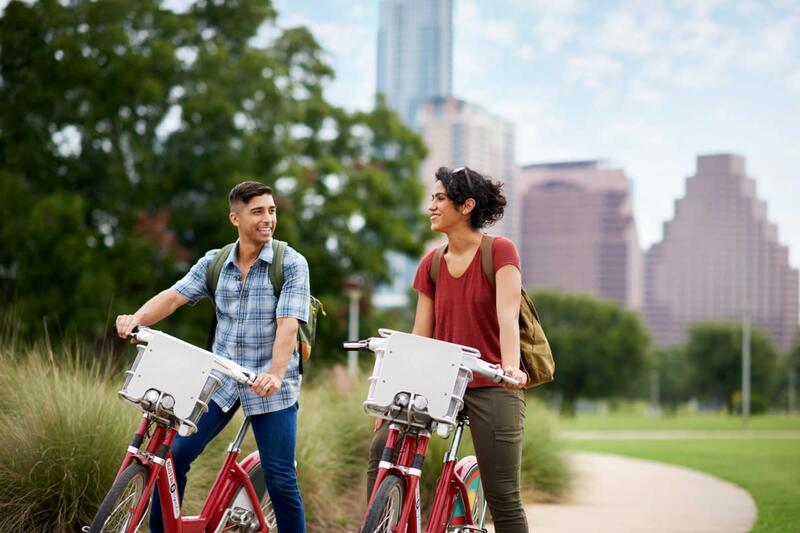 Road riders will want to bicycle from downtown to Mount Bonnell, peddling Scenic Drive along the waters of Lake Austin and catching an awesome sunset view from Pennybacker Bridge. The paved Southern Walnut Creek Trail, part of the city’s Walnut Creek Trail System, is an urban trail designed for both bikers and pedestrians. Combine great swimming with people watching at the historic Barton Springs Pool, just minutes from downtown Austin. Located in the heart of the 360-acre Zilker Park, this swimmer’s paradise features clear water fed from underground springs that stays a refreshing 68 degrees year round, along with grassy hills for sunbathing. Located a 40-minute drive from Austin in Texas Hill Country, Hamilton Pool Preserve is a geological wonder. This historic swimming hole was formed by the Hamilton Creek spilling out over limestone outcroppings, creating a dramatic 50-foot waterfall that plunges into a canyon. Emma Long Metropolitan Park, situated along the shores of Lake Austin, is one of the few places where visitors can camp inside the city limits. 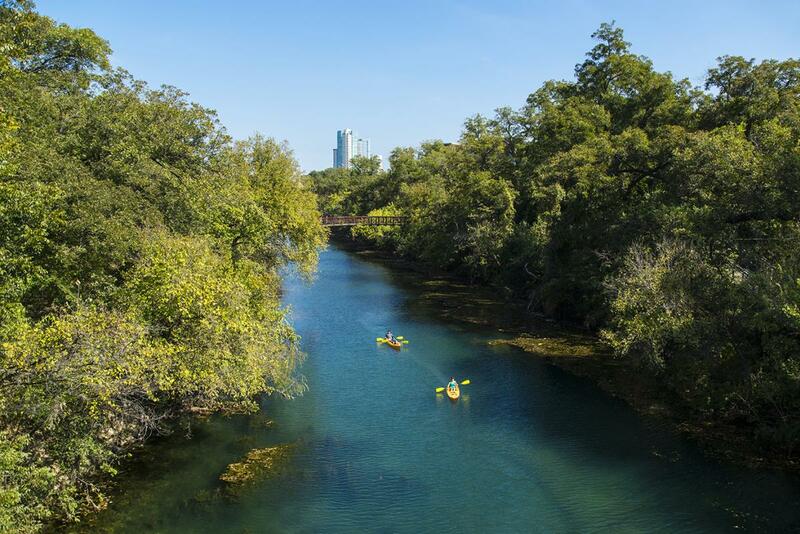 Located just 25 minutes from downtown Austin, the park features waterside campsites, giant cypress trees, hiking and biking trails, swimming and boating, and spots for picnics and grilling. 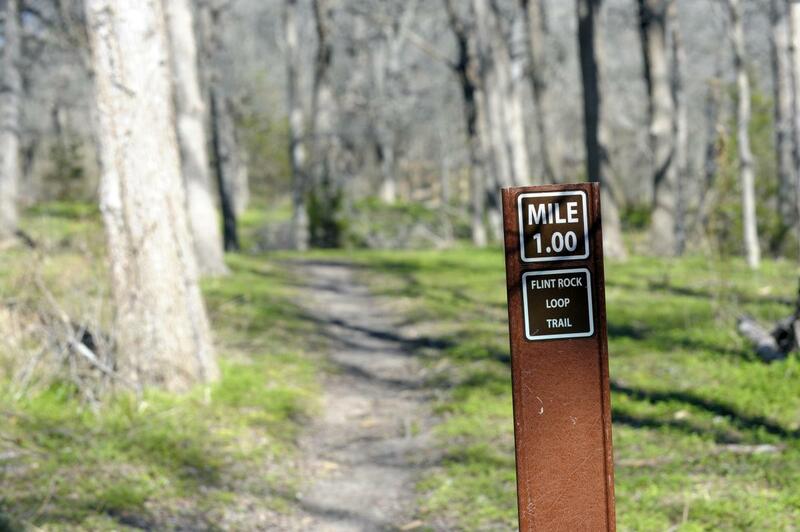 Located just southeast of downtown, McKinney Falls State Park offers 726 acres with nearly nine miles of hiking and cycling trails, playgrounds, picnic areas and a campground with 81 sites (featuring electricity and water hook-ups) and six cabins. 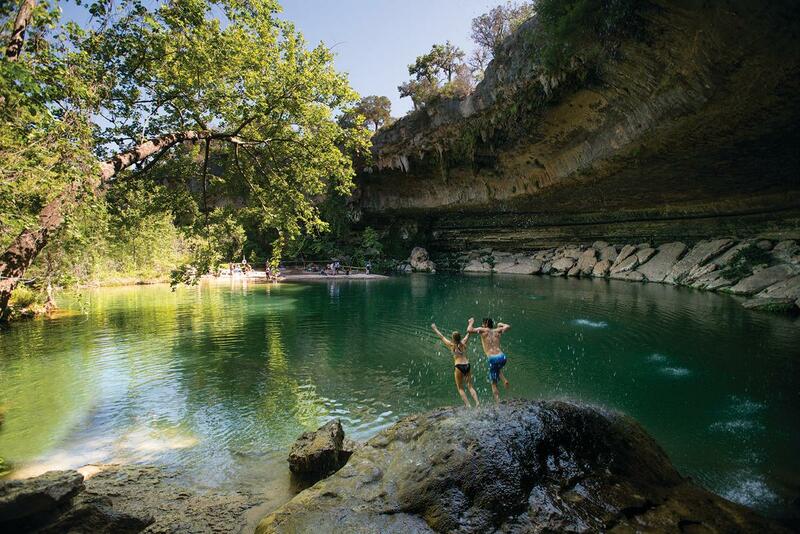 Hike or bike along the Barton Creek Greenbelt to reach Gus Fruh, a swimming hole known for its famed Urban Assault limestone rock wall that’s a favorite of climbers. Explore further to discover the hidden Twin Falls and Sculpture Falls areas, where you’ll find relaxing shallow stream waters and plenty of rocky areas for adventurous climbing and exploring the falls. Reimers Ranch Park offers more than 300 different sport climbing routes on highly technical limestone cliff walls that skilled climbers love to scale. Many of the routes have bolts, anchors and fixed cable draws in place, so climbers can access popular routes with protection. Kayakers at Lady Bird Lake. Lady Bird Lake is a reservoir created by two dams on the Lower Colorado River which flows through downtown Austin. Motorized boats aren’t permitted, so Lady Bird Lake is a perfect destination for kayakers, canoers and stand-up paddleboarders. It’s easy to get out on the water at Lady Bird Lake, where you can rent stand-up paddleboards, kayaks and canoes from the Rowing Dock, Congress Avenue Kayaks, SUP ATX and more. For an insider’s perspective, take a guided kayak or stand-up paddleboard tour of downtown Austin with Austin City Kayak Tours. Both beginners and experienced paddlers are welcome. Lake Travis is Austin’s largest lake, with countless coves and immense water depths (up to 210 feet), making it a favorite boating destination. There are several parks surrounding Lake Travis, including Pace Bend Park, known for its dramatic backdrop of limestone cliffs and abundant wildlife. An hour northwest of Austin, Muleshoe Bend Recreation Area in Spicewood is tucked into a picturesque bend of the Colorado River. The recreation area boasts wide-open riverfront views, boating, 34 secluded campsites, mountain biking, hiking trails and horseback riding.